Now it’s the city’s turn again to figure out what to do with a roadway that everybody hates but that 153,000 vehicles trundle across each day. It’s not as if the project has gotten any cheaper or easier. So far, the city’s DOT has floated two, more or less equally horrendous options: make piecemeal repairs, causing eight years of Munch’s Scream-level congestion, or commandeer the Brooklyn Heights Promenade as a temporary highway and tolerate a different kind of misery for a mere six years. The projected cost ranges from $3 billion to $4 billion, but it seems prudent to consider that time frame and budget as an attempt not to scare the kids. This is, after all, a city that can’t build a little branch library without spectacular delays and overruns. I feel for transportation commissioner Polly Trottenberg. She works within a system that makes it virtually impossible to get out her bureaucrat binoculars and peer into the future of her field. Instead, she has a right-now dilemma of her own: kick the can down the potholed road again, or inflict suffering today so that in 2030 (or ’40) we can enjoy what may by then be an obsolete monster. Climate change, congestion, automated driving, and common sense will make personal cars in cities the cigarettes of the 21st century, offensive to most, beloved by some, and perennially hard to kick. One way to help usher in that future is to let the BQE expire of natural causes. Catastrophe! the DOT cries. Brownstone Brooklyn will be clogged! Joralemon Street will transform into a parking lot. Maybe. It’s well known — except, it seems, among highway-happy politicians — that widening a congested road creates a wider, equally congested road. The more lanes you build, the more they fill up. The converse is true, too. A landmark 2002 article by a group of British researchers (Sally Cairns, Stephen Atkins, and Phil Goodwin), called “Disappearing Traffic: The Story So Far,” documented what happens when urban roads go away: so do drivers. That conclusion has been confirmed many times, and it’s not really a mystery. Traffic, like water, flows where it can, filling up available channels until it’s diverted into other routes or drivers decide they’d rather walk or take the subway. Government can manage the volume of vehicles with tools it has so far been reluctant to use, like congestion pricing, East River bridge tolls, and a less mortifying transit system. Or it can spend billions on roads. City officials also have freight on their minds, because trucks make up about 11 percent of the BQE’s volume and the number could rise. Consumers who expect safety pins, soap, and lawn blowers to be teleported from website to doorstep forget that all those purchases translate into truck traffic on the city’s streets and roads. And as Industry City, the Brooklyn Army Terminal, and the Brooklyn Navy Yard become busier every day, they too are trucking ever-more components in and finished products out. But those are reasons to take a close, hard look at how we will be moving goods around an ever-denser region a few decades from now — maybe not by box truck and tractor trailer. The industrial waterfront relied on water-based transportation, for example; the postindustrial waterfront might do the same. In any case, committing to a multibillion-dollar replacement of a single troubled highway shouldn’t be step one. It’s an innovation with venerable roots. The landscape architect Michael Rapuano, who designed the BQE along with his partner Gilmore Clarke, spent time in Rome, gazing at the urban vista from terraces just like this. Charles Birnbaum, the head of the Cultural Landscape Foundation, makes a persuasive case that the Promenade was Rapuano’s translation of Rome’s Pincio into Brooklynese. 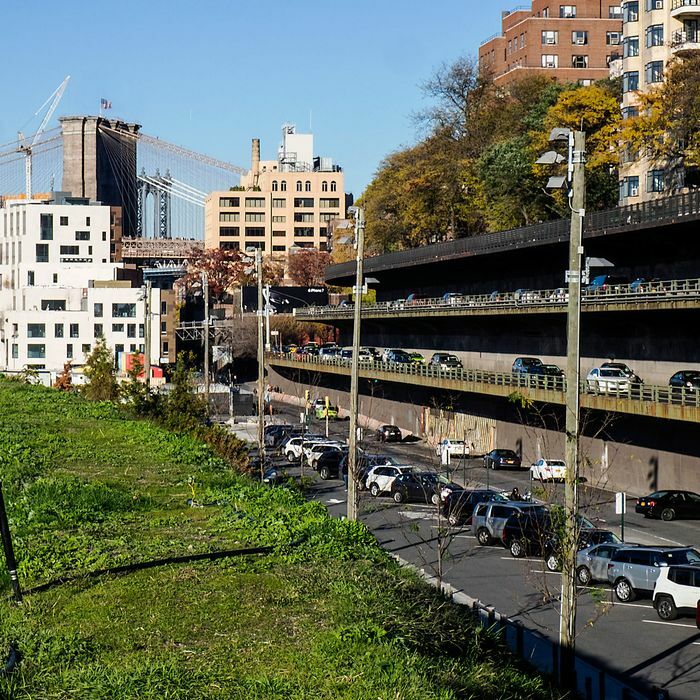 The architects Marion Weiss and Michael Manfredi have made the point that the BQE’s stacked design — “compact bunk-bed urbanism,” they call it — should inspire a new generation of infrastructure that incorporates parkland and public space. The idea of layering infrastructure is ancient and new again. When Florence’s Old Bridge, the Ponte Vecchio, was destroyed and rebuilt in the 14th century, it was lined with shops. The Pont Notre-Dame in Paris supported a whole residential neighborhood of 60 grand houses, until they were demolished in the 18th century. When Grand Central Terminal was rebuilt and its tracks were decked over in the early 20th century, the project created Park Avenue, with a generous pedestrian median, and a complex of hotels and office towers called Terminal City. 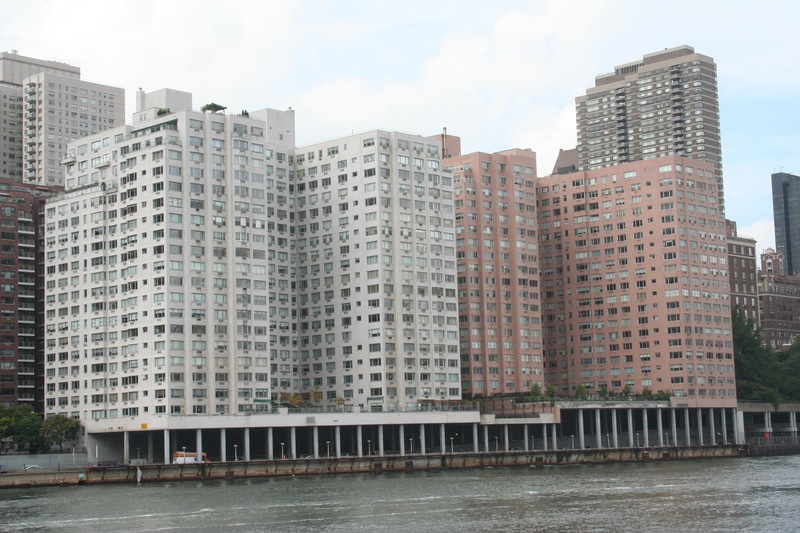 Later in the century, engineers threaded the FDR Drive between the East River and the city’s edge, which in some spots — at Sutton Place and the U.N., for instance — grew out over the highway. More recently, architects have proposed growing entire villages on the structures of existing bridges and viaducts, emulating the way mollusks attach themselves to concrete piers. On a more modest and practical scale, Toronto has begun reclaiming the wasted acres beneath its Gardiner Expressway and turned them into the Bentway, an ice-skating trail that links outdoor markets, art, and performances. The most thorough way to eke urban acreage from a space-hogging highway (short of deleting it completely) is to bury it. 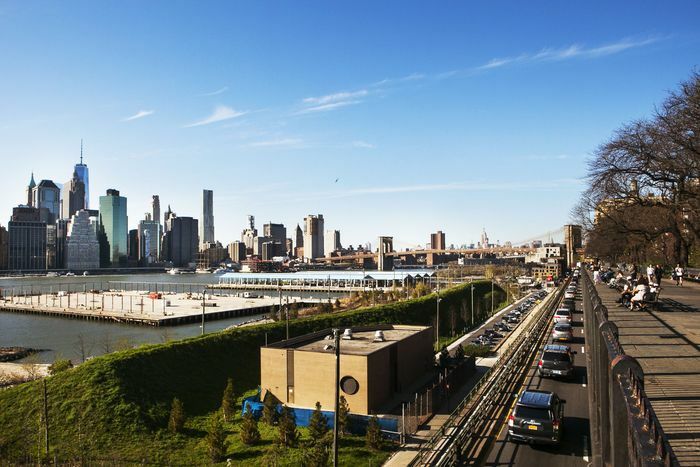 The DOT has rejected that solution for the BQE, on the grounds that it is cumbersome and expensive. And yet tunnels can perform miracles. Oslo rerouted a highway that ran through its heart, banishing it beneath the fjord and reclaiming the waterfront for foot traffic and, well, life. Boston’s Big Dig, which buried a stretch of interstate, took 15 years, cost $24 billion, and caused astronomical levels of grousing, but it also freed up 300 acres and rejoined parts of the city that the elevated highway had sundered. To anyone who ever sat for hours, fumigated and immobilized, on the I-93 at rush hour, being able to stroll along the Rose Kennedy Greenway, which follows the same route, is a major urban gift. And yet, despite all the creative thinking that history provides, the city remains stubbornly unwilling to think beyond a demolish-and-replace strategy for the BQE. “A technology of solving the physical problems had been perfected” in the mid-20th century, writes Robert Caro in The Power Broker, his landmark biography of Moses, “but not the methods and machinery for the creation of large-scale urban public works in a democratic society; the American system of government almost seemed designed to make such creation as difficult as possible.” That’s still true. As the nation’s roads and bridges tumble into obsolescence, the great generational challenge will be how to get the most livability out of their replacements. Unfortunately, a system in which politicians can toss thorny. expensive problems back and forth for decades is anathema to long-range thinking. Which is why we’re still speeding over 100-year-old bridges and through ancient tunnels with our fingers crossed.